As cicadas on the East Coast begin emerging from their 17-year slumber, a spritz of dew drops is all they need to keep their wings fresh and clean. 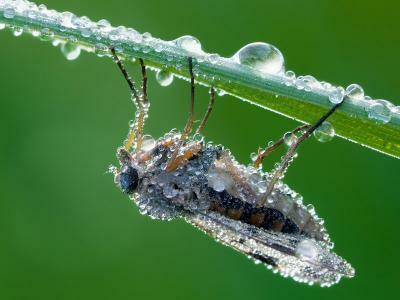 Researchers at Duke University and James Cook University in Australia have shown that dew drops can be beneficial not only in cleaning cicada wings, but other water-repellant surfaces. On these so-called superhydrophobic surfaces, dew drops “jump” by themselves, carrying away the contaminants. A team led by Chuan-Hua Chen, Alfred M. Hunt Faculty Scholar and assistant professor of mechanical engineering and materials science at Duke’s Pratt School of Engineering, demonstrated that tiny particles such as pollen can be removed from cicada wings by a phenomenon he has described as jumping droplets. When growing dew drops coalesce together, the merged drop jumps off water-repellant surfaces. The jumping motion is automatic, powered entirely by the surface energy initially stored in the dew drops. Using a specially designed high-speed video imaging system, the engineers captured the jumping water droplets on a cicada wing, as well as the associated self-cleaning processes. “The ability of water-repellant surfaces to self-clean has conventionally been attributed to rain droplets picking up dirt particles,” Chen said. “For this conventional wisdom to work, rainfall must be present and the orientation has to be favorable for gravity to effectively remove the rain droplets. These limits severely restrict the practical use of self-cleaning superhydrophobic surfaces. The results of Chen’s research were published online in the journal Proceedings of the National Academy of Sciences. Katrina Wisdom, a Duke undergraduate and a Pratt Research Fellow in Chen’s lab at the time of this study, was the paper’s co-first author. Cicadas are flying insects typically a few inches long. The most common species emerge on a yearly basis, with some U.S. species arriving every 17 years. When they dig out from underground as nymphs they molt, shedding their skin to reveal their wings. They then take flight as full-grown cicadas, spending the next four to six weeks flying around searching for and attracting mates with their distinctive song. After depositing eggs in the ground, the cicadas die and the cycle begins anew. Cicada wings are characterized by rows and rows of tiny bumps or domes of various heights and widths. They look like upside-down ice cream cones, with the conical tips projecting upward. When a water droplet lands on this type of surface, it only touches the points of the bumps, creating pockets of air underneath the droplet. The droplet is kept aloft by this cushion of air, much like the puck in an air-hockey game.